The second national seminar of the year 2003 will be held at the Wise Observatory on May 8 & 9, 2003 (Thursday-Friday). The special two day program will include an open day at the Wise Observatory and lectures. The main goal of this program is to expose undergraduates to the wonders of astronomy and astrophysics. You are all encouraged to invite students in your undergraduate astronomy courses to come. From experience, they are keen to visit the observatory. Everyone is also encouraged to bring their families if they wish to come, as was done for a similar event we held about 14 years ago with great success. Info on the first national seminar this year can be found here. Info on the three national seminars last year can be found here here , here and here. 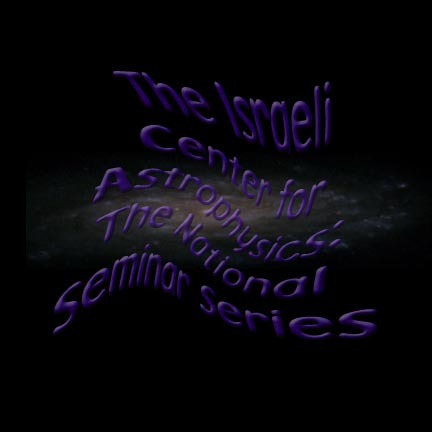 Noah Brosh (TAU): "Near Earth Objects"
Avishay Gal-Yam (TAU): "Variable Afterglows"
10:05-10:30 Erez Ribak (IIT): "Adaptive Optics"
10:30-10:45 Nir Shaviv (HU): "Towards Resolving the Faint Sun Paradox"
Ella Gruman (BGU): "A New Pulsar Emission Mechanism"
Eran Ofek (TAU): "Time delay measurement of the lensed quasar HE1104-1805"
Vincent Desjacques (IIT): "The Cosmic Microwave Background, What Does it Tell Us About the History of The Universe?" Students 4/room (prices are higher than previously advertised: 220 per first two people, then 85 for each additional one). Supper 41 shekels. Breakfast is included in room price. Total of 200 spaces possible. You may mention than your are a national astrophysics seminar participant and ask to stay with other participants in your room. Students 6/room at 91 shekels/person. There are 34 of these rooms for 204 students. Non-students 2/room at 228/couple/room. There are 13 of these rooms for 26 people. Total of 230 spaces possible. Supper 31 shekels. Breakfast is included. There is also the Ramon Inn (4 star hotel) for the more affluent. Since the meeting is subsidized (location, coffee & lunch - each time by a different institution) everyone is expected to come. There should be no excuses! Due to the different venue, participants should request dinner reservations by sending e-mail to hanab@bgumail.bgu.ac.il (until April 30th). Only students (undergrad and graduate), faculty etc. can be subsidized, nevertheless, please inform us if any family member or friend is coming, to allow us to reserve a place for them too. Dinner will be held in the Field School. The price for Family and Friends is 41 NIS. For academic participants, it is subsidized. (Dinner is also available in the Youth Hostel for 31 NIS). We assume that most participants come with their cars, or with friends with cars. If you are comming by bus and need transportation arrangements (from the bus station to the field school [which a not so short walking distance from the Observatory] or back to town on Friday morning), please send an e-mail to: hanab@bgumail.bgu.ac.il and we will try to make the appropriate arrangements. On thursday afternoon, there is a direct bus from Be'er-Shava, at 15:45, which takes 1 hour. At 16:35 and 18:00, there are buses which take 1 hour and 25 minutes. On Friday, the most appropriate buses are the 12:30 and the 13:30 to Be'er Sheva. They also are 1 hour and 25 minutes each. The bus station is not far from the Matnas, both are in the center of town.